I get asked all the time - is Silhouette Studio Designer Edition worth the upgrade? What features are included with Silhouette Studio Business Edition? Does the highest upgrade include the features of the others? Finally, I decided to put together an easy to read list of features, tutorials, and FAQs about all of the Silhouette Studio upgrades. I can tell you - there's never been reason to upgrade straight to Silhouette Studio Business Edition. With the release of Silhouette Studio V4.1 and the upcoming release of Silhouette Studio V4.2 (in closed Beta as of 5/2018) there are a lot of new features - many of them not available in the free basic Silhouette Studio version. 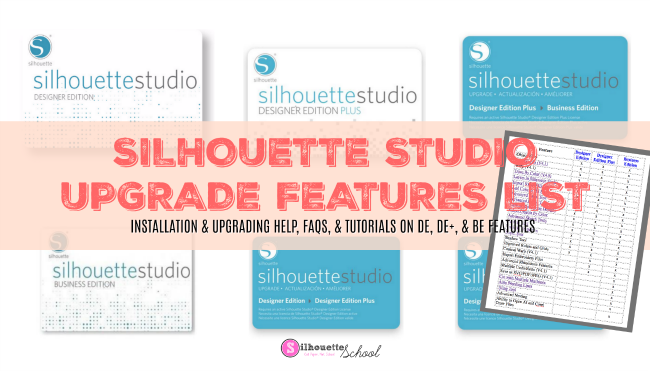 Below the list of Silhouette Studio upgrade features for Silhouette Designer Edition vs Silhouette Designer Edition Plus vs Silhouette Business Edition you'll find answers to some answers frequently asked questions about these Silhouette Studio upgrades. Clicking on any of the "Features" will take you to Silhouette School tutorials on that feature. The Silhouette Studio version that is in parentheses after some of the features indicates when the new feature was introduced (explaining why it might not be found in earlier versions). Are the upgrades free? No, upgrading to Designer Edition, DE + or Business Edition is a one time paid upgrade and the price depends on the level of the upgrade. Below is a list of complete upgrades from the basic/free version of Silhouette Studio. If I already have Designer Edition, for example, can I buy a prorated upgrade to DE+ or BE+? Yes! If you are already on one upgraded version of Silhouette Studio, and later decide to upgrade further, you can buy the partial upgrade. When I purchase a Silhouette Studio upgrade, how is it delivered? It depends on where you buy it. Some retailers will send a physical card, while others will email you immediately with a 16 digital license key to access the upgrade. How do I install a Silhouette Studio license key? Your purchase of a Silhouette Studio upgrade will come with a 16 digit license key. To activate the upgrade, open Silhouette Studio and enter the key through the Help Menu. Full step by step tutorial activating a Silhouette Studio upgrade license key. What happens if I lose my license key or need to re-enter it? You can find your license key by signing into your Silhouette America account under the My Accounts tab. Full step by step tutorial re-activating a Silhouette Studio upgrade license key. Do I need to buy Silhouette Studio Designer Edition (or DE+ / BE) again if I get a new computer? Nope. You can move your license key to a new computer with these steps. A question from a relative newbie. I am looking to upgrade to business edition, but I am wondering if running 2 machine simultaneously includes a cameo and a curio or is that apples and oranges? Hi, I have Designer Edition V3 release 3.3.642ssde How do I upgrade to V4? Is it a free upgrade?